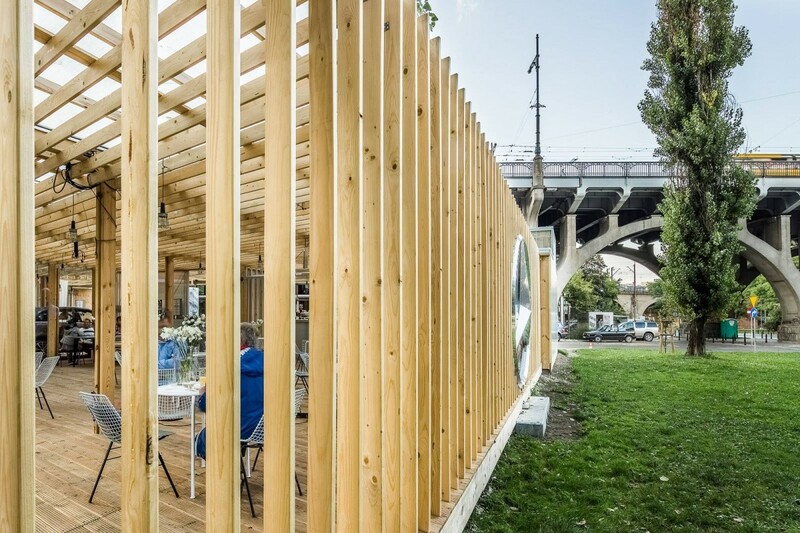 A temporary pavilion, located in the midst of the Warsaw city, played a role of a gadget of sorts, a structure bearing a neutral, if not even agressive relation with the place of its erection. However, this kind of approach seems to be rather pointless here remembering that, firstly, Warsaw is the place of numerous temporary and chaotic interferences in its urban structure (all negative connotations of permanent – temporary architecture), secondly – the pavilion was designed to remain in its place for at least half a year. 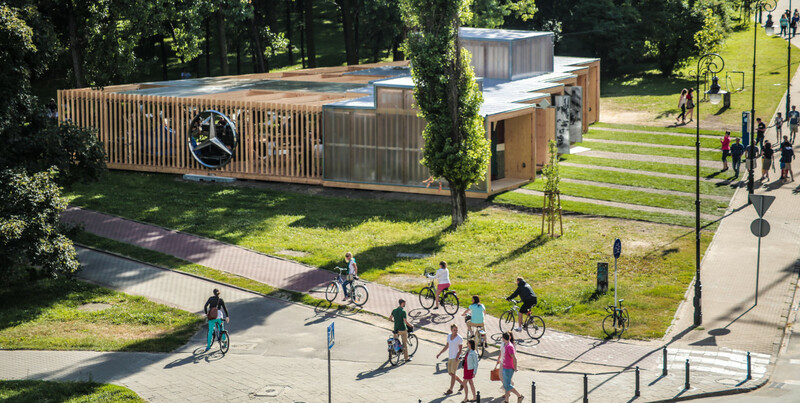 The Pavilion succeeded in meeting the needs of local communities, mainly Warsaw dwellers of younger generations, for whom it became an attractive, popular meeting place, a venue where workshops, lectures, exhibitions, fairs, festivals and all sorts of other events were organized. The place of spontaneous meeting or a well chosen, premeditated Saturday night hangout. The pavilion form arises from the reference to housing estate detached garages with their characteristic form consisting of repeatable modules with doorways. In its groundfloor part the pavilion reproduces this geometry, its upper part constitutes a dynamic, sculptural form. The chosen location was an allottment which until last year was taken by a cluster of housing estate garages (they have been demolished). It is in Powiśle district, at the crossroads of Kruczkowskiego and 3 Maja streets, less than 100 metres from Powiśle station and an extremely popular club Warszawa Powiśle located under it. A direct neigbourhood of Powiśle viaduct – part of Poniatowski bridge – allows, on the one hand, for a view of Pavilion from above, for making use of its ‘fifth elevation’, on the other hand a big area, sheltered from the elements is naturally created where at present a temporary weekend vegetable market is held. The particular modules have been designed as light, wooden structures reinforced and insulated with perforated sheet metal and multi-chamber polycarbonate panels. The usage of semi-transparent materials will allow to illuminate the building after dusk. The terraces surrounding the pavilion are envisaged as wooden, friendly surfaces inviting the visitors to take a rest. The doors to garage entrances have been designed in the form of mobile screens differently shaped, finished with reclaimed sheet metal produced from pressed fragments of car bodies. Each surface has a unique, unrepeatable character and artistic colouring thanks to remains of different car paints. Only reclaimed or reclaimable materials was used in the pavilion construction. 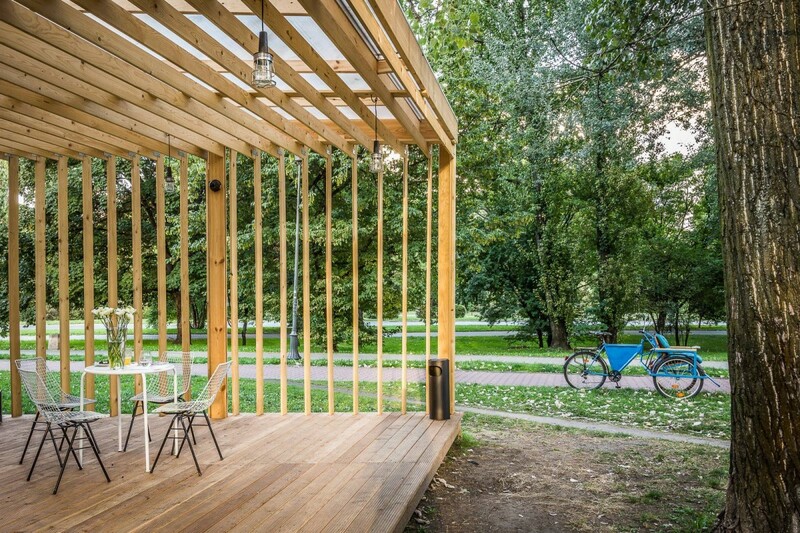 Different urban functions will be assigned to particular zones of the pavilion which will help to embed it in a social and cultural life of Powiśle district – one of the most popular parts of Warsaw, especially in warmer seasons when it is visited by crowds of the city inhabitants and tourists. East part of the pavilion will be dedicated to city sports. Here, it will be possible to get advice and information referring to the city’s offer in this respect as well as to avail of services of bicycle workshops. 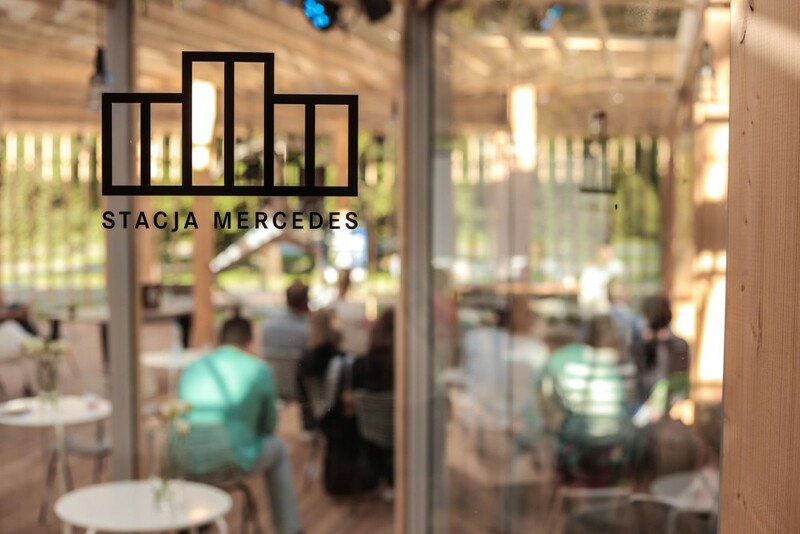 The next module will comprise the recreational zone – a place with some tables, chairs and seats of different sorts where one can relax, read some newspapers and books, use the free Internet connection – namely, the extension of an extremely popular nearby cafe PKP Powiśle. The next module will contain the exhibition space where a model of a Mercedes will be presented. Due to transparent walls and proper lighting it will be visible from the outside both during the pavilion working hours and at nights. This zone will also host the Mercedes staff who could be offering information and advice, arranging for test drives and meetings with the car dealers in traditional Mercedes salons. In the direct neighbourhood a visitor will encounter a gallery where during the whole period of the pavilion’s functioning young, original artists, fashion and graphic designers and other creative people will be presenting their works.